Signs of Suicide (SOS) along with Social-Emotional Learning presentations and screening is used in all secondary schools. Signs of Suicide is the only school-based suicide prevention program listed on the Substance Abuse and Mental Health Services Administration’s (SAMSHA) National Registry of Evidence-based programs and practices that addresses suicide risk and depression, while reducing suicide attempts. Learn about the curriculum and access resources at www.suicideispreventable.org. More than two dozen Youth Mental Health First Aid (YMHFA) trainings for staff and local community members were provided over the last two years. The Marysville School District continues to offer, free of charge, this widely successful training and certification. YMHFA provides an easy to understand and interactive training that educates, informs and de-stigmatizes issues related to mental health disorders. It also provides trainees with a practical plan and strategy to support an adolescent experiencing a mental health crisis. After successfully completing this course, trainees receive a three-year certificate as a YMHFA responder. Learn more and sign up for sessions HERE. mental health therapists, Student Assistance Professionals (SAPs), and Prevention and Intervention Specialists (PRIs) in all Marysville School District secondary schools. These professionals provide targeted assistance with mental health issues, drug and alcohol resources and support for students. Learn more HERE. The Marysville School District partners with Sound Mental Health (SMH) to provide support for the District’s Special Education population. Sound Mental Health provides specialized trauma support, direct therapy service, group therapy, case management skill development, and public presentations on the unique needs of special education students and how trauma impacts them. Learn more about our partners at www.sound.health. materials, consultation services and technical assistance. Learn more about our partners at www.schoolcrisiscenter.org. The Marysville School District has one of the most robust securities staffing in the state with security officers assigned to all middle and high school campuses, five School Resource Officers (Marysville Police Officers), and a facilities and security supervisor who oversee District protocols and practices. 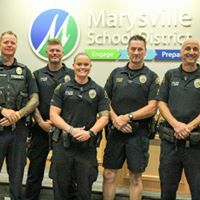 Over the past few years, the City of Marysville has helped the Marysville School District provide five School Resource Officers. School Resource Officers are highly trained members of our local police force who provide law enforcement and police services to schools, school grounds, and areas around the school. They are also responsible for investigating allegations of criminal incidents and work to prevent juvenile delinquency through close contact and positive relationships with students, staff and school administrators. How often do schools conduct emergency drills? What kind of emergency training is provided to staff? In coordination with the Marysville Police and Fire Departments, our security department provides hazard specific training to all Marysville School District staff. This training includes Incident Command System, earthquake readiness, Active Shooter, Disaster Medical, and Search and Rescue, to name a few. What can I do at home to teach my child(ren) about emergencies? Although children receive training while at school, talking to your children at home is a key factor in preparedness. Make sure that your family has a plan in place and practices what to do in emergencies at home. This will translate into readiness at school. Being able to talk to them about the seriousness of emergencies and listening to whoever is in charge also plays a large role while organizing and practicing preparedness during drills at school. You may find this website helpful for tips on discussing school safety with your child(ren). Are my children getting age/grade appropriate training? Our security department works closely with schools to ensure that the information being provided to students during drills is age appropriate. Please talk to your children about school safety at home so that they are prepared for drills at school. Where would I find my child in an emergency? Depending on the nature of the emergency, your child may be released through the normal pickup procedures at their school, through modified pickup procedures at their school, or through a parent/child reunification process at an off-site location. Please DO NOT go to the school during an emergency. Information will be released through the District Website (Link), Facebook page (Link), Twitter (Link), Smart Phone App (Link), local media, and other district communication tools such as School Messenger to advise you of any special circumstances for release. What is the procedure to collect my child during an emergency? This would depend on the nature of the emergency. If modified pickup procedure or an off-site reunification is needed, it is required to show photo ID to sign out your child. Children will only be released to those who have been listed on the Emergency Release Form, which is filled out at the beginning of the school year. May I pick up children who are not mine during an emergency? You will not be allowed to pick up children who are not yours unless previous written consent is on file with the school, which identifies you as an emergency contact for the child or children in question. What is the difference between a lockdown and a external lockdown? A n may be initiated when there is potential danger in the neighborhood, but not directed at the school. It is usually initiated by police, and is designed to keep the danger outside of the school. Typically it lasts only a few minutes, but in some instances, it may last longer. During a external lockdown, no one will be allowed in or out, so meetings at the school may need to be rescheduled. External lockdowns are precautionary. A lockdown is initiated when there is a threat to the campus or school. All threats are taken seriously. In the interest of student safety, a lockdown may be initiated while the nature of the threat is evaluated. As with any emergency, please DO NOT go to the school during a lockdown or external lockdown situation, as you will not be able to access the school or pick up your child. Information will be released through the media and through district communication tools mentioned above. The District will advise you of any special circumstances for release. Can I schedule a training/presentation for my PTA/PTSA group? To inquire, contact Marysville School District Facilities and Security Supervisor, Greg Dennis at (360) 965-0136 or Greg_Dennis@MSD25.org. Our schools also ensure that all school visitors sign in and have a name badge to identify that they are approved to be on the campus. We also ask that as parents, volunteers and other visitors, you help us in this effort by always signing in and identifying yourself, regardless of how many times you may have visited the school. All school staff receives Active Shooter Training and the Marysville Police Department puts together regular Active Shooter Training Drills at our schools (Not during school hours) to ensure our first responders are prepared for any scenario. Emergency drills are conducted monthly at each of our schools to help staff and students understand how to respond in the event of an emergency. In addition, the Marysville School District uses the Rave Application. The Rave Mobile Safety App allows all Marysville School District employees to activate the Rave Panic Button, which instantly dials 9-1-1 and sends a text message to on-site personnel. The application also provides five buttons labeled active shooter, police, fire, medical and other. These tools have helped locate missing children, identify suspicious people at schools, and increase response times to threats and medical emergencies. Learn about how this has been used successfully in our schools at https://goo.gl/p4RNZm. GoGuardian is a program used by school staff and administrators to filter student Chromebooks on and off the MSD25 network and allows for different filtering policies at high, middle and elementary school levels. The system sends Smart Alerts to necessary staff if students are searching explicit or self- harm content. It also includes some theft recovery options, and allows teachers to orchestrate and control student devices in the classroom. The Marysville School District partners with Sound Mental Health (SMH) to provide support for our district’s special education population. We also use Signs of Suicide (SOS) and Social-Emotional Learning curriculum and screening in all our middle and high schools. Signs of Suicide is the only school-based suicide prevention program listed on the Substance Abuse and Mental Health Services Administration’s (SAMSHA) National Registry of Evidence-based programs and practices that addresses suicide risk and depression, while reducing suicide attempts. You can learn more about the curriculum and access resources at www.suicideispreventable.org.